Below is a dyno chart from the Sierra Sierra Evo, equipped with the EFR 8374, Full-Race Twinscroll Manifold, 2.2L engine, revving to 8500rpm with ~32 lbs (2 bar) of boost. 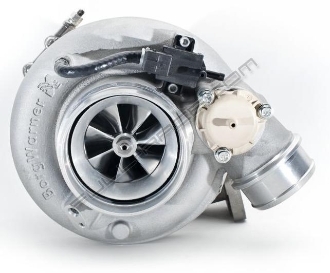 Wastegate Info: All EFR Internal Wastegated turbos come standard with a medium boost actuator for boost levels of up to 16psi. For boost applications above that will need to add the High Boost actuator. Use the option tab to add it to the order. V-Band Discharge Flange/Clamp: All of the EFR Internal Wastegated turbos use a special BW Vband flange/Clamp that is not a standard V-Band. The Down Pipe V-Band Flange and Clamp are not included with the turbo. Use Option tab to add them to the order. *Includes ground shipping within the Continental United States only. Please contact us for all other shipping options.